The other day H proclaimed 'I have to do everything around here!' Really? Because I just asked you to put your pajamas in the laundry basket. Then it occurred to me that H and Charlie are plenty old to start having some regular responsibilities. They actually like to do things like dust and vacuum the couch cushions, though apparently putting an article of clothing in a basket ten feet away is akin to capital punishment. I have what one might call minor control issues, so having them do things like swiffer "Argh! You're just getting more dirt everywhere!" or clean the bathroom "Get away from the toilet, there are germs everywhere!" would be counter-productive if the goal was to have them take some responsibility in helping keep our house clean independently. Before I finally broke down and hired someone to clean my house monthly, the only time my house really would get dusted is if I was moving furniture around, actually moving, or my mom did it for me. Until now, we've moved every two to three years so that was totally fine, right? Therefore, dusting is the perfect example of a chore for me to 'give away'. I came up with a chart for each kid that includes everything from brushing their teeth and feeding the dog twice a day to making their beds and weekend chores like helping with their laundry and dusting or wiping down the bathroom counters. I printed it on a normal 8.5x11 sheet of paper, trimmed the edges and put them in an 8x10 frame with a marker for each so that they could check off their list without having to print a new sheet every week. They're on the bathroom counter so they can look at them as they're getting ready. Charlie's gonna be wicked good at making x's by the time he hits kindergarten. When I showed it to them, they were actually both really excited. (Really.) H asked if he was going to get paid a dollar per chore, and I just laughed at him. Um, no. 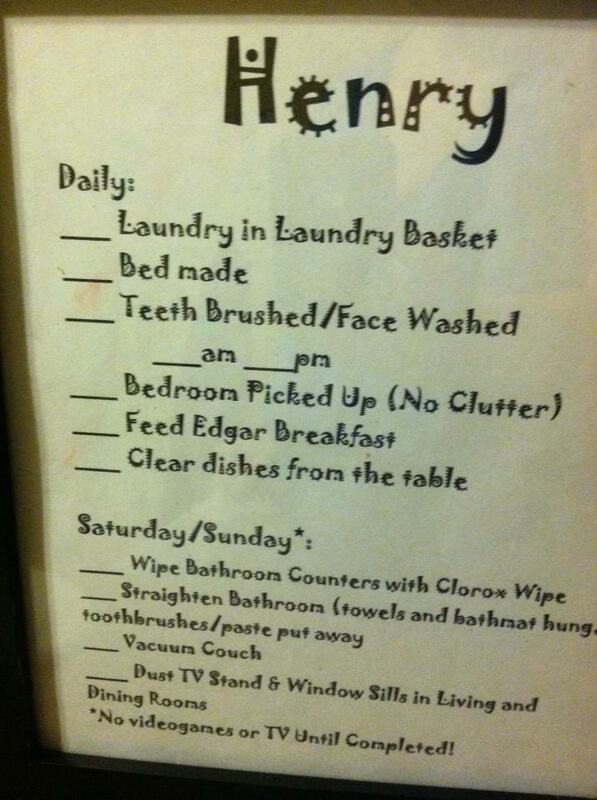 Your 'reward' for completing these menial tasks is to live in a nice house that you can feel pride in helping to create. And leisure time. The screen time is a much bigger carrot than 'sense of accomplishment' but whatev' it'll come. So far, they have been doing a pretty good job, especially with the weekend chores because they're still kind of a novelty. Either way, it's nice to have a little help, and it motivates me to get the work done first thing while they're still eager to help so that it becomes routine. It's always surprising to me how long I wait to give H a task, yet Charlie is perfectly capable of it at the same time even though he's three years younger. I have so much to learn about parenting, but I guess that's why the first kid is kind of like the first pancake. A little crispy, maybe even slightly burnt, until you get the temperature of the griddle just right for the others. Ah, the guilt that comes with being a highly imperfect mom.